Showcase Windows and Doors builds high-quality custom products specifically designed for the Gulf Coast climate. We use vinyl for our frames due to its strength, durability, insulating properties and low maintenance qualities. A vinyl window has a frame made of Polyvinyl Chloride resin (PVC) which is ideal for windows. Vinyl has natural insulating properties so there is little-to-no energy loss through the frame or sash of a vinyl window. While wood may exhibit this property at first, over time wood can warp, crack and succumb to mold. This lessens the integrity of the frame, allowing air infiltration and a loss of insulating capacity. Aluminum is a poor insulator because it conducts energy through the frame. Energy loss is inevitable and noticeable in an aluminum window. Eventually, a wood window frame can absorb the moisture around it. This has been known to cause frames to warp, crack and develop mold. These problems can be reduced with regular maintenance, refinishing and weather-proofing of the wood. Aluminum windows get pitted over time or develop corrosion in the form of white rust. These, too, will ultimately require labor-intensive care. The beauty of a vinyl window is that it’s virtually maintenance free. With vinyl, the color is built into the compound so it will not fade or require repainting. Vinyl windows will not absorb pollution or moisture which is important in the humid Gulf Coast region. No work is needed to maintain the performance and beauty of a vinyl window. A simple wash every now and then to remove dirt is all that’s needed for vinyl windows to look and perform as new. 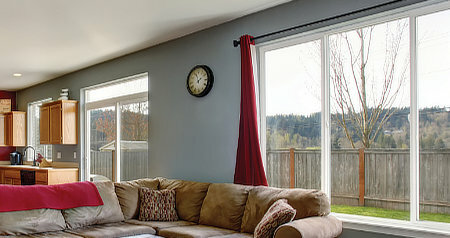 Your vinyl windows from Showcase will provide a lifetime of worry-free performance. Energy efficient vinyl windows help lower your energy costs, reduce our impact on the earth and preserve our natural resources. The manufacturing process for vinyl is less detrimental to the environment when compared to other products. Did you know one of the main substances used to produce vinyl is derived from salt, an abundant, naturally-occurring mineral? And did you know that vinyl is 100% recyclable? It can be reclaimed and reused in a multitude of manufacturing processes. Most companies in the window industry tend to mass produce stock-sized windows which can lead to waste. At Showcase Windows and Doors, our products are custom built for each order to reduce the potential for waste. Be smart for the earth and your wallet with Showcase Windows and Doors.